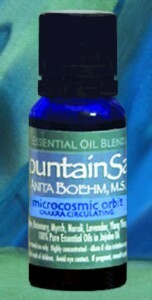 The Microcosmic Orbit™ (Chakra Circulating) essential oil blend is formulated to access each of the 7 chakras & circulate through the Microcosmic Orbit channels of the body (search the Internet for great diagrams!) to enhance meditative practices, pranayamic (breathing) practices, Qigong & yogic, practices, & general well-being. This, highly concentrated, 100% pure therapeutic essential oil blend contains: Frankincense, Rosemary, Myrrh, Neroli, Lavender, Ylang Ylang, & Cedarwood in a Jojoba oil base. These oils aid to open blockages from the crown to the root chakra, respectively. Formulated for chakra and channel opening, Frankincense is a meditative essential oil that helps to remove blocked energy where our ego tends to dwell instead of our Divine Self. Rosemary is an invigorating essential oil that aids in overcoming fogginess, creating greater intuitive clarity. Myrrh is intended to help us become a channel for truth & expression. Neroli opens us to unconditional love. Lavender aids in gaining insight into our Higher Selves to overcome imbalances associated with self-esteem. Ylang Ylang is intended to open our creative and sexual energies & Cedarwood “roots” us to the foundation of our being. These oils are great for every day use to awaken your access to your inner being and, of course for meditation, breathwork, Qigong, and yogic practices. Place the oil blend directly beneath your nose or at the top and base of the spine to create a deeper vibration in the energy centers of the body. If skin irritation occurs, dilute further in any additional base oil (more jojoba, grapeseed, etc.). Oils may also be added to a diffuser, bath, or used for general massage when further diluted in additional base oil. Discontinue use if skin irritation persists.